As craft cocktail bars get geekier and more experimental, we like to remember that some of the absolute best cocktails were created with simplicity in mind. And you certainly don’t need a full bar to whip up something balanced and sophisticated at home. To that end, we’re digging into our fridges and pantries to craft stellar drinks with ordinary ingredients you already have at home. Whether you're using up produce that might otherwise go to waste, or finding a new use for an item you can't get enough of, we're here to remind you that when it comes to mixing drinks, you don't have to get crazy to raise the bar. This September, consider the humble cucumber for refreshing cocktails that’ll keep summer going just a bit longer. Just be warned: while they bring a pleasantly cool and fresh taste to many recipes, cucumbers can also overpower drinks, giving them a salad-like quality. So be mindful of how many cucumbers you use, and what kinds. English cucumbers are sweeter and milder, while American cucumbers tend to lean more bitter—which actually works well for sweet drinks. Here, we’ve compiled the best ways to use to use these versatile vegetables in your at-home cocktails—along with an easy recipe to try. The easiest, and most obvious way, to use cucumbers in cocktails is to shake them in a refreshing, citrus-forward drink like an Eastside, a gimlet with mint and cucumber, or the Pepino, a traditional tequila sour shaken with cucumber. Mint, in particular, is a natural companion—in fact, there’s an entire family of mint-and-cucumber drinks known as “Maid” cocktails. 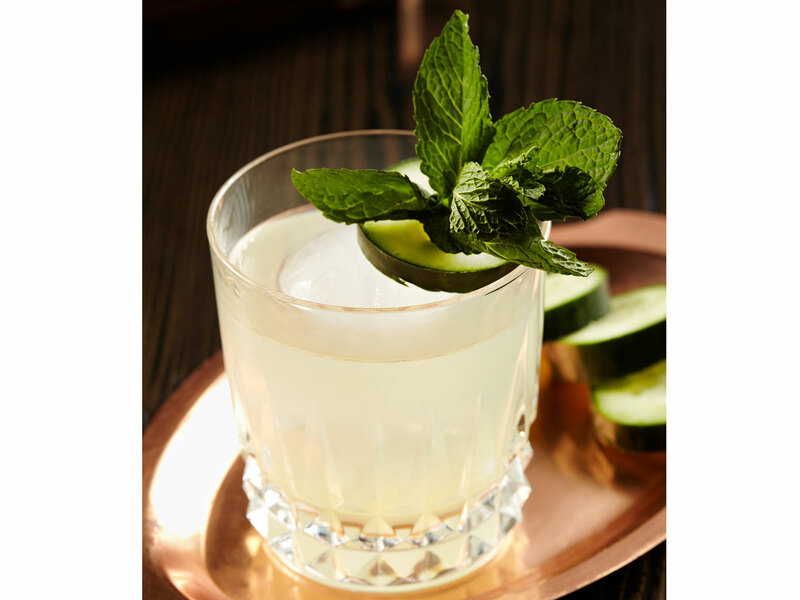 First named by prolific barman Sam Ross, the standard is the Old Maid, using gin, lime, simple syrup, and muddled mint and cucumber. But depending on what spirit you’ve got on hand, you’ll be making a different variation: vodka (Polish Maid), tequila (Mexican Maid), bourbon (Kentucky Maid), and so on. The key to shaking drinks with cucumber is to watch your ratio. For any standard drink with two ounces of spirit, you won’t need more than three to four thin slices of cucumber to achieve that fresh flavor. Also be careful not to over-muddle, which will cause bitterness—especially if you are shaking with a big cube of ice, which will further break down the slices. Feel free to skip muddling altogether if you feel the drink is too vegetal for your liking. In a saucepan, heat one part of sugar and one part of water until the sugar dissolves. Peel your cucumber, cut out a few slices, and add them to the mix, cooking on low for no more than two or three minutes. Strain out the cucumbers and store the simple syrup in a covered, refrigerated container. Experiment with any cocktail recipe that calls for simple syrup to find what works for you. To tone down the sweetness of certain liqueurs or add a secondary layer of flavor to a spirit, try infusing the whole bottle with cucumber. At New York City’s Pool Lounge, director of bar operations Thomas Waugh’s simply-named “Cucumber” cocktail has become one of its most popular offerings, fusing cucumber-infused absinthe with lime, simple syrup in a coupe glass lined with baby cucumber slices. For his cucumber absinthe, Waugh adds about 300 grams of thinly sliced cucumber into one 750 milliliter bottle of absinthe. He then lets it steep for 24 hours, before straining out the cucumbers for use. This method works for just about any spirit, but particularly vodka or gin—mix it up with a few leaves of basil or other herbs if you like. We need to talk more about cucumber garnishes. Adding a cucumber to a glass automatically signifies something refreshing, and there are several fun ways to truly glam up your cocktail with a cucumber garnish. Line your glass with cucumber slices like Waugh does, or poke the stem of your mint sprigs through the soft middle part of your cucumber wheel, using toothpicks to affix it to the edge of a glass. And if you’ve got a lot of time, use a potato peeler to create cucumber “twists” that be spiraled onto a cocktail spear or place on the side of the glass. Instructions: First place cucumber and mint at the bottom of the cocktail shaker. Optional: muddle both to release juices. Combine spirit, lime juice, simple syrup, and ice. Close and shake until shaker becomes frosty. Strain into a rocks glass filled with ice and garnish with a cucumber wheel and mint sprig.